Graduation is a stepping stone for our international students. Life after Puget Sound promises a variety of possibilities. Check out what some of our students share about their academic and career plans for the next steps in their lives. I am planning to start my graduate study in a Bioscience program. I am interested particularly in Neuroscience, and the biological bases of consciousness and mental functions. In your opinion, how does Puget Sound prepare you for graduate school? People said this a lot but I never realized until graduate school application process. Puget Sound has a very intensive writing requirement across many disciplines. In academia and even in industry, communications are very important. As a science major, the ability to communicate well your scientific inquiry is imperative to your success. Therefore, I find Puget Sound a great place for any career preparation because of the skills the university helps me develop, one of which is writing. In addition, I think the size of the campus allows for great interactions between faculty, students and staff, and support for students. College is a time for many great developments, and without appropriate mentorship, one could not succeed so easily. Puget Sound provides that comfort of many resources and support that you can rarely find in other universities. You can be on first-name basis with most of your professors here, have inside jokes with them, and most importantly, know that your professors and staff know who you are as a person to tailor their guidance for you. What activities and/or on-campus jobs were you involved with at Puget Sound? I am actively involved in Greek Life here at Puget Sound. In particular, I am in Sigma Chi Fraternity. 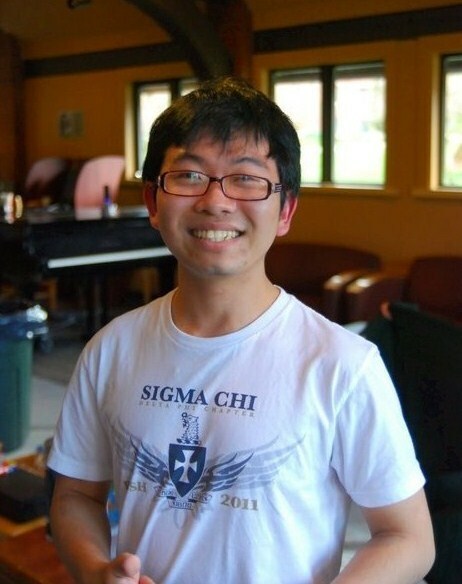 Through Sigma Chi, I am involved in many leadership positions, philanthropy/community service opportunities, and lifelong connections with Sigma Chis across the world. I am also working for and representing Residence Life for 3 years now. As a resident assistant, I have the opportunities to support students and the vibrant residential campus of Puget Sound. Could you tell us a little bit about your summer research that you did last summer? How did you get your research grants? I did one summer research in 2012. My research was on a neuroscience related topic. Particularly, I was investigating the role of a certain EEG neural correlates called induced gamma in perception of 3-D objects. I have been planning this project for a semester prior to the summer with Professor David Andresen, who has expertise in EEG and 3-D perception. I love the project and the science behind it from start to finish. It was definitely more difficult than I thought, but it really showed me what research was about and encouraged my love for research. This experience along with other research experiences following, I decided to follow a career in scientific research after graduating from Puget Sound. I was awarded Richard Bangs Collier Scholar and its grant for the interdisciplinary nature of my project to fund my summer stay. I also got the University Enrichment Grant to fund for my research materials. I got these research grants thanks to the mentorship of Professor David Andresen who provided me feedback that shaped my project in the direction that I wanted. I also got a lot of support from Center for Writing, Learning and Teaching for editing my application. I hope to one day become a successful neuroscientist and to get the freedom to investigate interesting scientific questions about the mind and its functions. I also hope that my curiosity for science will always get revitalized often so I am always motivated to do science. I plan to enter academia after graduate school, to hopefully become a Principle Investigator at a research institute. I applied directly to the International Programs at Grameen Bank with some help of my thesis advisor Pierre Ly. After I read a book titled “Building Social Business: The New Kind of Capitalism That Serves Humanity’s Most Pressing Needs” by Professor Muhammad Yunus – the founder of Grameen Bank, I became interested in his idea and got to know about different ventures that Grameen Bank had been doing together with multinational corporations to further its poverty alleviation efforts. I then tried to look for some information about the organization and see if I could intern there, but I wasn’t able to find the information I needed. When I mentioned this to Pierre, it turned out that he did some field studies in Bangladesh during graduate school, and he pointed me to the International Programs website at Grameen Bank where there was detailed information on interning there. I was excited about this opportunity, so I applied right away and Pierre helped with writing a letter of recommendation for my application. This internship was a flexible one in a sense that each intern got to propose his or her own project in the application and then work with an internship coordinator to tailor it to the organization’s needs at the time. For me, I focused on researching challenges of some joint ventures within the Grameen family. I spent the first half of my internship doing field visits and interviewing different stakeholders including village borrowers, field workers, and staff at Grameen HQ. I collected some qualitative data on their involvement with Grameen through those semi-structured interviews. I then spent the rest of the internship conducting interviews with managers of ten Grameen Bank sister companies about their progress becoming part of the Grameen system and major obstacles they had encountered since the inception. Many of those sister companies are collaborative projects between Grameen and multinational corporations like Groupe Danone, Intel, BASF, etc. It was a great experience for me, especially because I am interested in development work. I also think seeing and talking to people help me understand the Grameen system much better than just reading about it. How has it impacted you either as you're thinking about your future career or your interests in general? It has definitely drawn me more into development work in general and social business (or social entrepreneurship) in particular. When applying for the internship, I was looking for some field work related experience and wanted to know how I would feel about working in a new country with a culture that I am not so familiar with, as these kinds of experience are typical for a development practitioner. And I have to say, I enjoyed every day of my time there. The chaotic traffic, the cacophony of Dhaka streets, or frequent power blackouts in villages could exhaust many people – including me at first. But the more lives of female borrowers I got to know, the better I appreciated how each woman managed to overcome social prejudice in a male dominant society to work her way out of poverty, and how institutions like Grameen Bank could help with that process. As a result, I am now finding opportunities with some organizations like Ashoka Seattle that support social entrepreneurs to create some impact on their communities. After a year or so of work, I will go on to graduate school for development studies like development management, global human development, etc.